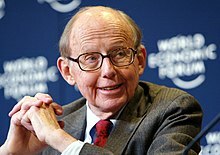 Samuel Phillips Huntington (April 18, 1927 – December 24, 2008) was an American political scientist, adviser and academic. He spent most of his career working at Harvard University, where he was director of Harvard's Center for International Affairs and the Albert J. Weatherhead III University Professor. During the Presidency of Jimmy Carter, Huntington was the White House Coordinator of Security Planning for the National Security Council. Huntington was best known for his 1993 theory, the "Clash of Civilizations", of a post-Cold War new world order. He argued that future wars would be fought not between countries, but between cultures. Many believed Hunting was responsible for helping to shape U.S. views on civilian-military relations, political development, and comparative government. Huntington died on December 24, 2008 in Martha's Vineyard, Massachusetts from congestive heart failure complicated by diabetes, aged 81. ↑ 1.0 1.1 Lewin, Tamar (December 28, 2008). "Samuel P. Huntington, 81, Political Scientist, Is Dead". The New York Times. Retrieved June 9, 2015. This page was last changed on 7 November 2018, at 18:44.